This is it! The final week of my Summer Impressions! Last week Rozen Maiden required me to watch it’s predecessor and Fate/Kalied just wasn’t as interesting as the rest of the shows I’m watching. That means we’re down to six, and at least one show has to go so I have my five for the season! Who will make it through? Only one way to find out. So, here we are. 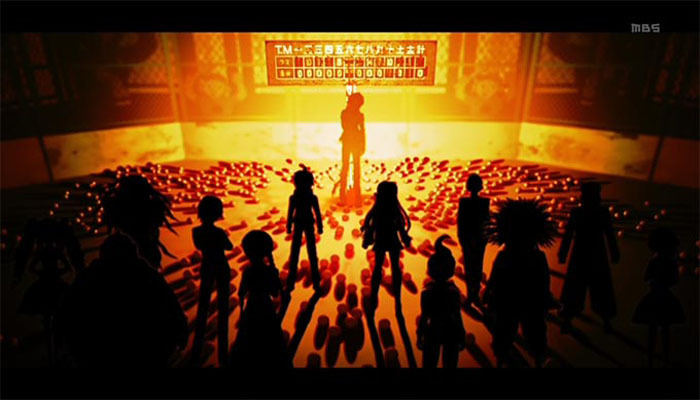 The first Class Trial. It kinda seemed rough to me, at first, but then again it’s the first one. The major problem I have is that I haven’t played the video game so I don’t know some of the mechanics that are used, the gun thing in particular. Seems similar to the Ace Attorney “OBJECTION” mechanic, which is what I’m going with here. I guess the big question now is, should I keep watching? Well..... I’m still kind of cautious with this show. There are a few things that were glazed over, like the evidence gathering in episode 2, that would have been nice to see more of. And, as a fresh face to this franchise, I know nothing about the mechanics that are copy/pasted or anything like that. I also spoke with someone who has knowledge of the game and she mentioned that it will be interesting how the series is going to fit six more cases into the 12/13 episode length, and that has me even more worried. This is why Danganronpa is going to get a Tentative Pass from me. I’m pretty wary about the mechanics and the episode length not being enough, but I’m willing to give the show more time to prove me wrong. Next up, the comedy I liked last week. I think I finally ran into a major problem with this show. Some of the characters have gotten on my nerves. There’s the high school girl who has some sort of brother complex and the slacker. They really drove me nuts this time around, so that downgrades the series a bit. The other problem I’ve now run into, is that the show isn’t really going any where at this point and it’s all just useless fluff. Now I know that’s the whole point, but there have been better ways of doing this. See Sgt. Frog if you don’t believe me. 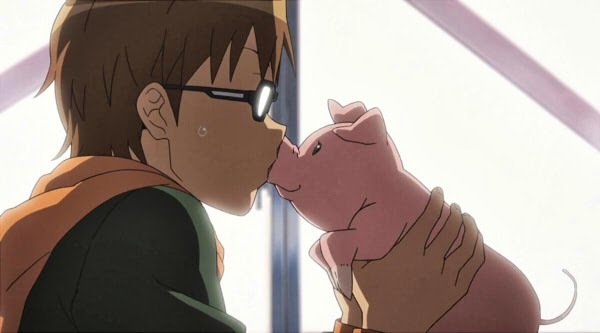 As much as I enjoyed what I saw of this show, I’m going to have to drop Servant X Service. I can’t really see myself watching anymore episodes right now. Maybe I’ll come back to it later, but right now, I really don’t want to. Back to hot swimmers! As a reminder, I’m keeping up with this series regardless. However, it’s still going to get a grade from me this week. This week we finally meet Rei, our final main character in the series who can’t swim. At all. This episode gave me a lot of laughs this week, and I’m don’t feel silly watching it anymore. 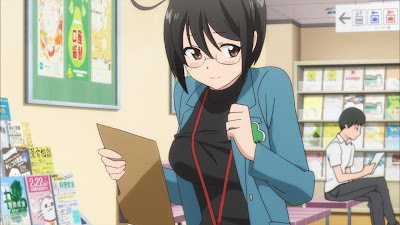 That’s right, I will openly admit that I was hesitant about this show since it’s Kyoto-Ani and some of their stuff is hit or miss depending on the person. That and since when have we seen a series from them that is full of eye candy men? Free is charming, funny, and has become a lot of fun for me which is something I always try to find. It’s up there with my favorites of the season, and it’s getting a BIG pass from me. If you’re looking for a fun summer anime, it doesn’t get any better than this series right now! Final Grade: BIG FREAKING PASS!!! Last week we took a break from the high energy into something a bit more quieter. This time we go back to the high energy, but it’s not as high as the first episode. I was gonna be concerned, however I’m not. The first episode had a lot going for it so coming back to that energy is good but too much would ruin it. 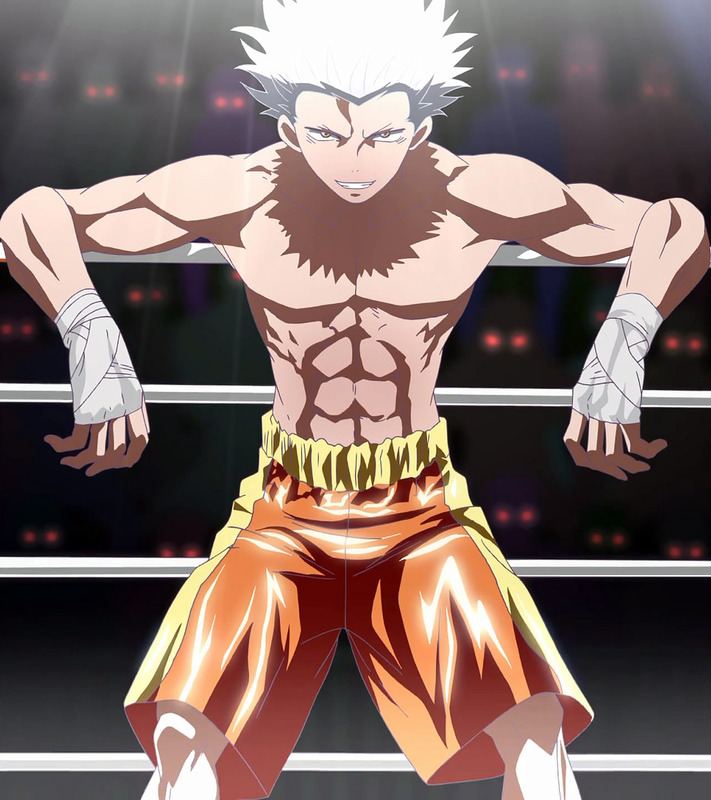 We also get to meet another major character this episode, Wolf, who is an old friend of Staz’s. Things get a little crazy throughout the episode and I loved every second of it. I am still worried about the energy coming to a crashing halt down the line, but what I’ve seen has made me enjoy it and want some more. Blood Lad is getting a pass from me. I’m looking forward to seeing what Staz and the others have to deal with next. Last week, this one was rather questionable to me because I wasn’t sure where I stood with this show. So, where are we at this point? Well it went a little darker this time around, albeit cause of the rain. However, Watamote got some chuckles out of me along with some other references to Ghost in the Shell and, I think, Deadman Wonderland. It’s slowly working it’s way into my heart episode by episode. But is it enough to pass it? Yes, but just barely. 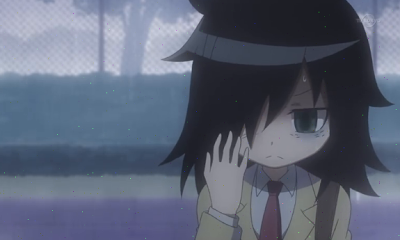 It still has a way to go to really get my attention, however I’ve liked what I’ve seen of Watamote and would like some more. Maybe I’m having problems with the humor or something, I really don’t know. But it’s charm is what’s going to keep me coming back each week. At least for right now. Last but not least, back to Silver Spoon! And this week it looks like we’re getting a little more meat into the story. At least during the last minute or so. The big thing I’m happy about though is more character development. You can have a good story and have it look pretty but the characters help drive the story. As for wether or not I’m going to keep watching this show, that’s a yes. For the past three episodes it’s been simple and charming with a look into how Hachiken is adjusting with his new school and attempting to find what he wants to do. But with these recent developments, I’m very interested in seeing where this series will go. My guess is, an attempt to bring Hachiken home. Alright! Let’s see where this season stands! The poll was an interesting experiment, but I’ve been hearing a lot from other summer shows that I had to pass up. So, because of that, I think I’ll stick to choosing my own shows from now on. If you think there are any I missed out on, let me know in the comments! And if you know of some fall shows already announced, then go ahead and bug me about them. Who knows? Maybe they’ll make the cut next season! Until then, otaku on my friends! Did you know you can shorten your long urls with AdFly and earn money from every visitor to your shortened urls.